Today was Thanksgiving in Portugal (almost two months early) for my wife’s American friends who have been living in Italy. There’s not much to tell, so I won’t. I cooked a lot. It went over well. I met one of my sister-in-law’s Portuguese friends and my wife’s friend’s partner from Italy. Both tried to greet me with kisses on the cheek, but I out-awkwarded them. I did not go on vacation to kiss people I don’t know, and if that’s a requirement I should have been warned ahead of time. 1. 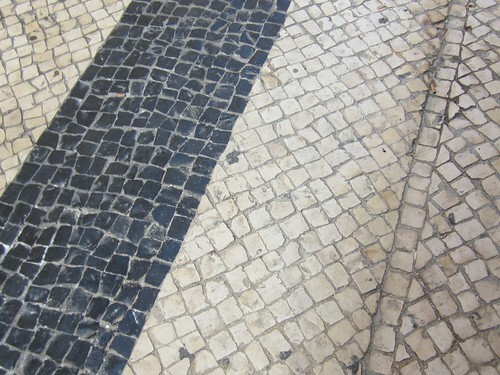 Portuguese sidewalks are made of calçada which is really just a whole lot of similar, mostly square, stones laid out in a grid. Many of the websites that talk about it address the art/mosaic qualities it sometimes has: In downtown Lisboa, the sidewalks have all sorts of designs. In Tomar, they were Templar crosses. But those are in the historic districts, not the regular neighborhoods. In the rest of the country, it’s just plain yellow stones. Here’s a pic. Yeah, it’s not flat. I’m sure it’s super-sturdy and resilient, but man is it unfriendly to feet and bicycle tires. Bom dia. Queria um cafe, fazh favor. Translated: Good day. I would like one coffee, please. If you want two coffees, you say “doysh” cafe. For three, “traysh” cafe. “Doysh” has become my new favorite word. 3. If it’s after noon, you can switch out “cafe” for “imperial” (imp-ear-ee-AHL), which is a schooner of beer. The house beer is generally a light bock. If you want a full pint, you order something else, which I don’t remember because I’ve never ordered one. But that’s only in the southern part of the country. In the north, it’s something else. 4. It seems to me that Portuguese sounds like a mix of Spanish and Russian. 5. Lisboa has pushed my tolerance for funny waiters who do intrusive comedy routines into the red zone. Let’s consider this an opportunity for my personal growth. 6. Portugal, Brazil, and several other Portuguese-speaking countries recently enacted an agreement that would bring their different versions of the language into one. A number of changes and simplifications have been made with regards to the way people spell certain vowel sounds, and with the elimination of silent letters in words. However, the weirdest thing is that Portuguese now includes letters it didn’t have before: K, W, and Y. 7. Portugal has a lot of graffiti. pronounced “cal-SAH-da” I believe. In Portuguese, the “C” always makes a “K” sound when the vowel that follows it is an “A”, “O”, or “U”. If the vowels that follow it are an “E” or “I”, it makes an “S” sound. “Business! Mankind was my business” Annual repost.